Ali Patberg drives into the paint. Photo courtesy of Indiana Athletics. Some wrote off Indiana before the year had begun, with their just-graduated star personnel in mind. Then the Hoosiers blazed off to a 10-0 start, upset No. 15 Michigan State to begin 2019, and found themselves ranked in the AP top 25 poll for the first time in more than two years. They have played fearlessly, with passion, and are clicking as a unit faster than expected. But if anyone is surprised, it isn’t Indiana. Fifth-year coach Teri Moren has worked to foster a strong team culture, and it has grown beyond what any imagined. A sense of family is key to the team. 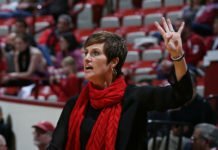 Moren wants Indiana players to spend time together off the court, knowing it will improve their game on it. “We are doing things outside of the floor, outside of the court, I think that has helped us become closer,” she said. Moren formed a book club, and the Hoosiers have read works by author Jon Gordon about leadership, culture and teamwork. They’ve read “The Energy Bus,” and are now reading “The Power of a Positive Team” together, with each player presenting a chapter to the team. But the book club isn’t just about the books themselves: it’s about finding different ways to make sure the players are bonding. 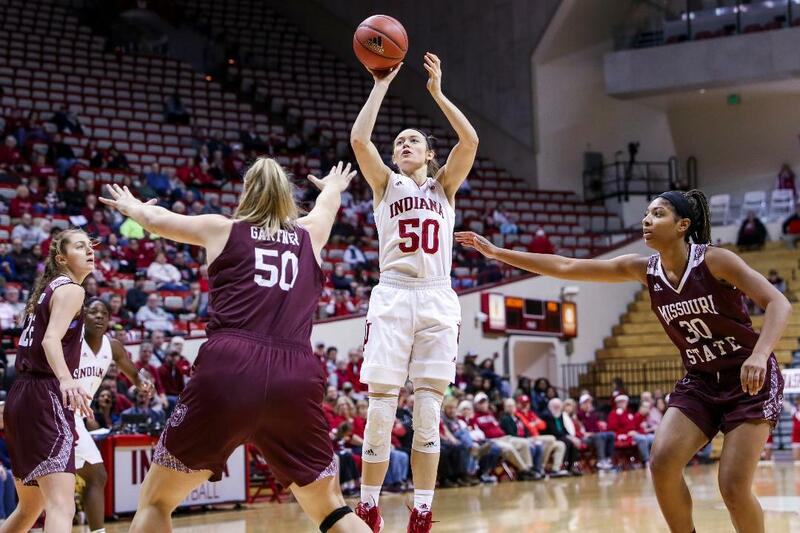 Guard Ali Patberg said “juice” for the Hoosiers is all-encompassing. “If we are not giving good juice, if we are not having good, positive body language, if we are not encouraging one another, then we are not doing our part for team, and we are not going to be as successful as we want to be if we don’t have good juice,” she said. That environment Moren has built has paid off in a plethora of ways. The winning – Moren’s .630 winning percentage – is the highest of any Indiana women’s basketball coach in more than 40 years. The team won the WNIT Championship last year, led by stars Tyra Buss and Amanda Cahill. Brenna Wise elevates for a shot. Photo courtesy of Indiana Athletics. Patberg and Wise, both redshirt juniors, have taken the mantle from Buss and Cahill, who graduated last year as two of the greatest to ever play for the program. 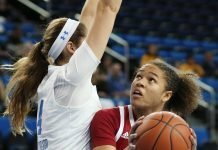 Patberg is averaging 16.7 points, 5.8 rebounds and 5.1 assists per game, while Wise is contributing 13.3 points and a team-high 7.3 rebounds. 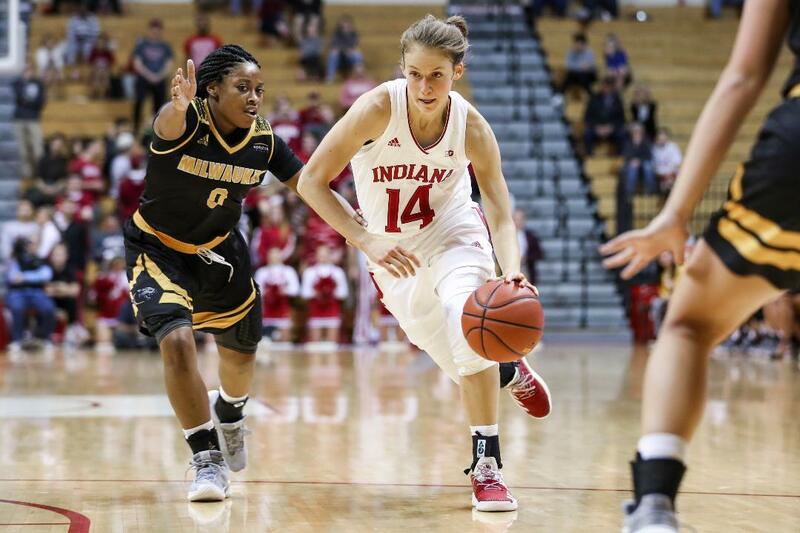 Patberg and Brenna Wise, both redshirt juniors, are each playing in their first season for the Hoosiers, as Patberg transferred from Notre Dame and Wise came from from Pittsburgh. But aside from their age, they are very different. Patberg was a star guard in high school, Indiana’s Miss Basketball and the MaxPreps National High School Player of the Year in 2015, her senior year. One of the top high school prospects in the nation, she chose Notre Dame. The perennial powerhouse had started recruiting her in eighth grade, getting the commitment in Patberg’s sophomore year. But early into her freshman season in South Bend, Patberg tore her ACL in a scrimmage. She missed the entire season and played only sparingly her sophomore year. Patberg insists playing time wasn’t the issue, but felt overall Notre Dame wasn’t the fit she wanted, and she began the transfer process. Two states away Wise, a forward, seemed to be living out her dream. She was starting, and starring, on her hometown team at the University of Pittsburgh. She led the Panthers in scoring and rebounding her freshman and sophomore year, yet something felt off to her. 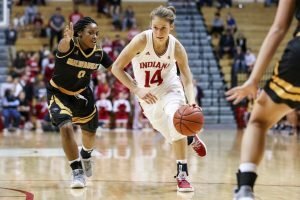 Patberg and Wise decided to transfer to Indiana, both citing the environment that Moren helped build. The two sat out last year due to NCAA transfer rules. While challenging, sitting out gave them perspective they found invaluable. When things got particularly difficult, the two leaned on each other. 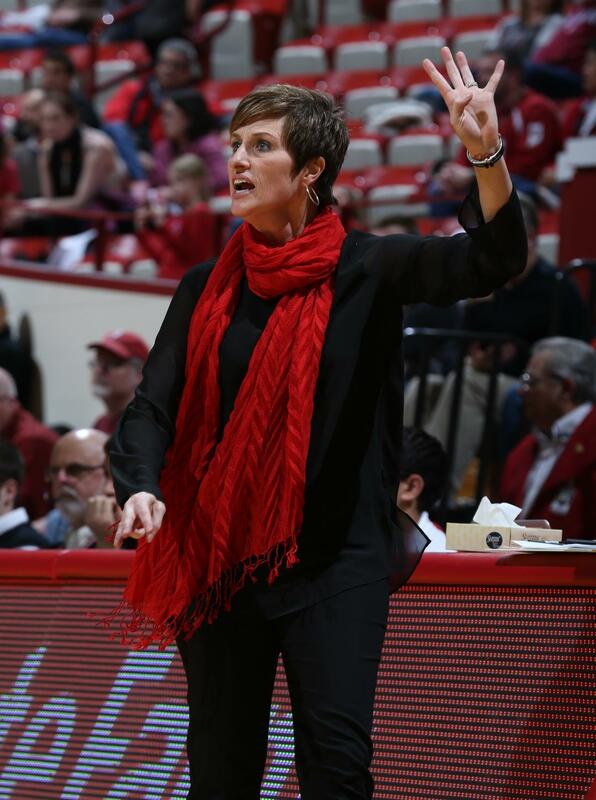 Coach Teri Moren is in her fifth season at the helm of the Hoosiers program. Photo courtesy of Indiana Athletics. Through the hours in the gym and film room, improving a game they couldn’t display to the outside world, a bond was formed that went deeper than basketball. The Hoosiers’ start this season was the best in program history. Then they lost three of their next four games to unranked opponents, including sub .500 Ohio State and Northwestern. Yet, the team’s lone senior, Kym Roster, said they aren’t worried. Moren isn’t worried about what shows up in the box score, either, knowing the team relies on things that can hardly be quantified. “The thing that you guys look at on the stat sheets, the grittiness, the toughness, the hustle plays, the charges, all of that never shows up on the stat sheet,” she said. Stats be damned, it seems these Hoosiers are sipping the juice.